While you're outside enjoying the sun this weekend, take a minute to check your fruit trees. Amid the ripening fruits, you may spot one that doesn’t look so tasty (see below). This is brown rot and it shows as distinctive circles of pale coloured dots on the brown fruit as the fungus spreads. It’s contagious, so get rid of these fruits straight away - and don’t put them in the compost bin, get rid of them completely. Apples, plums, cherries, damsons, quinces and pears can be affected and it spreads very quickly, so you need to be vigilant. 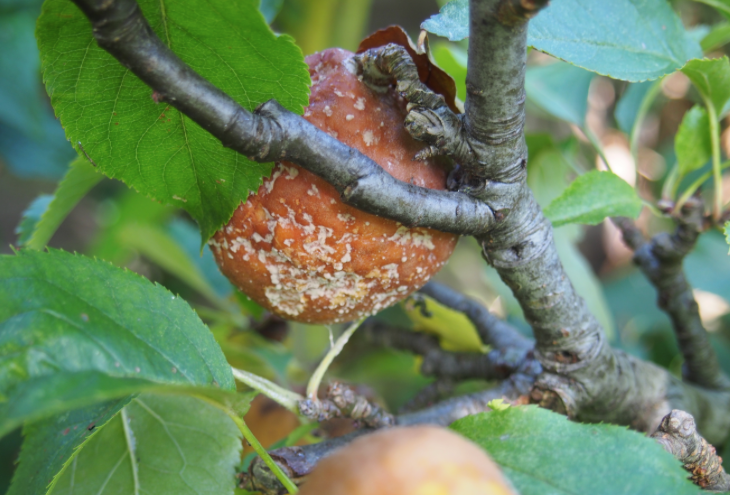 Once you’ve harvested the crop over the coming months, get rid of any remaining little shrivelled fruits that may be hanging on the tree and also clear away all the fallen leaves where the spores can overwinter to re-infect the tree again next year. Good hygiene in the garden is the key to controlling a lot of common fungal problems, as is good pruning to allow air flow through the plant. Fungus loves a still, moist atmosphere where it can develop and grow, so it’s always worse in a wet summer. The more air that can blow through between the branches, the less chance there is of the fungus taking hold. This particular fungus is also responsible for blossom wilt in the spring, where the blossom turns brown and rots before the fruit can set. Over time, the whole fruiting spur and then the entire branch may die off. If your tree has been particularly badly affected, you can spray it after leaf-fall with Copper Mixture (Vitax), which will help eliminate any remaining spores, but remember to spray the ground underneath the tree and any nearby fencing or walls as well, as these are all ideal over-wintering areas. Spray again just before bud burst in spring, but DO NOT spray once the flowers begin to open. Feeding the tree will help it fight off infection, as a healthy plant can recover more quickly from an attack by pests or diseases. A general fertiliser like Growmore can be applied at 100g per sq metre (4oz per sq yard) and watered in, but do this around the edge of the root system, where the tree’s feeder roots are. This is just around the “drip line” at the edge of the tree’s canopy. Putting it around the base of the tree is a waste of time, as there are few, if any, small feeder roots in that area.